On the empire’s side, the richest, strongest, most dangerously armed military in world history. A worldwide network of perhaps 1,100 bases and hundreds of thousands of troops with the most sophisticated weapons of mass destruction, extending from space; networks of surveillance, secret operations, indefinite detention, with political cover of compliant politicians justifying more and more. At Hancock, this power was expressed through police forces arrayed around us, photographing from every angle, threatening arrest and prison terms for stepping over an arbitrary line on the street. On the side of humanity, in opposition to the war OF terror, a few hundred people, many with white hair, deploying the means of song, speech, costumes, music, symbolism, and appealing for justice, at pains to recycle and not harm the grass. 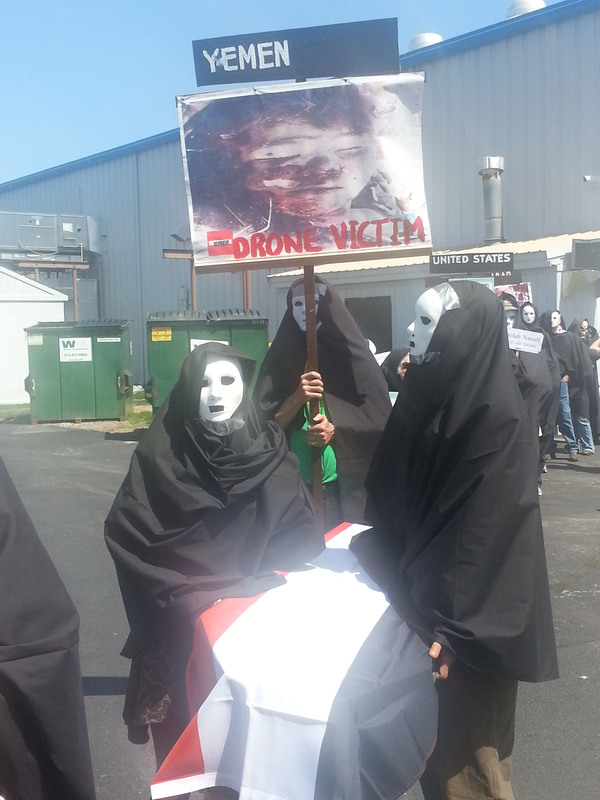 The protesters carried the names and photographs of people actually killed by the drones, reading their names aloud, and symbolically dying on the street. Their weapons, the truth that the war on terror is illegitimately destroying whole countries and people. People who participated in the demonstration, including some who were arrested, came from all over the country to raise an outcry against the proliferation of drone strikes abroad, including countries with whom the US is not at war. Drone use violates the US Constitution, Article 6, and International Law, which the U.S. has signed on to. Demonstrators also object to the militarization of the police and the growing domestic use of drones. Greg Semmel is commander of Hancock AFB. What does the US military and the government fear from political protest at the gates of the base, such that people engaged in non-violent speech and actions would be banned from being on the street near it? Likely, they fear that thousands will come with the same message. But nothing they do can make the US war on terror, with its drones and concentration camps, legitimate, just, or moral. The thirty-one arrestees were arraigned in De Witt Town Court before Judges Benack, Gideon, and Jokl, who imposed bails ranging from $500 – $3500, totaling $34,000. Some of the defendants were released with appearance tickets Others are refusing to post bail and will be held in jail until the next court date of May 7th & 8th. Donations may be sent to the Syracuse Peace Council, with checks made out to Syracuse Peace Council, note: Upstate Drone Action Bail Fund. 2013 E. Genessee St., Syracuse, NY 13210. Who’s Blocking Drone Protest at Hancock AFB? 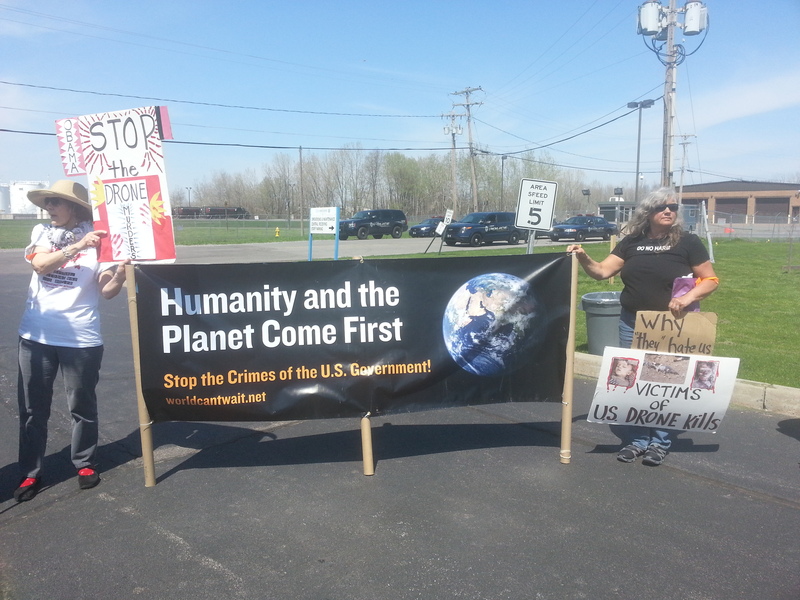 33 people were grabbed by county sheriffs on April 22, a few blocks from the main gate of Hancock Air Force Base near Syracuse NY. Faster than you can say “parading without a permit,” people at the front of a single file, silent march along a mostly deserted suburban road, were cuffed and stuffed into police cruisers. Others were arrested standing near the gate of the base, where people do a protest vigil every two weeks, because pilots based at Hancock control drones (unmanned aerial vehicles) over the skies of Afghanistan, and perhaps over other countries in the region. Given that we had just walked two miles in the Town of Dewitt, seeing people in only 3 yards, a total of 30 cars, and not one marked police car, one has to assume it wasn’t the good citizens of the town who were inconvenienced, annoyed, or even aware of the procession. Did the plan to stop our protest from arriving at the gate by arresting us before we got there come from the Onondaga County Sheriff’s Department? No, these arrests were ordered and planned at the federal level to preempt the delivery of a political message and to keep media from showing images of the group gathered by the gate. If the operations out of Hancock are so legit, so clean, and clear of legal ambiguity; if they’re arousing no opposition, then why are the powers that be so afraid of 100 people gathering at the front gate to present some papers to any guard who would take them? The ordinances used against this protest are probably unconstitutional curbs on free speech and assembly, and perhaps they’ll be challenged in court by those ticketed and released. But, to the substance of our charge that the U.S. drone programs, and the wars that underlie them, are illegitimate, unjust and immoral, what is the government’s answer? That we’re criminals for parading without a permit? While the 82nd Airborne units who posed with Afghan body parts are an aberration, and therefore not criminals? These lies are all they can come up with. They have no answer to the indictment we attempted to deliver but brutality and suppression. The Upstate Coalition to Ground the Drones and End the Wars did a similar action one year ago. 38 people stepped across a line to place themselves under arrest. At trial, they mounted a a thorough case, detailing the ways in which the U.S. drone war violates international law, and of course they were still found guilty. These actions, along with others at Creech AFB in Nevada, and recently at Whiteman AFB in Missouri, are bringing attention to the illegitimacy of the growing US deployment of drones to spread terror among the populations of whole countries. Despite a President who orders their use, despite the hundreds of people keeping each drone aloft doing their”jobs,” we refuse to accept the horrors we are protesting. Seeing the government, at several levels, take such clear action to suppress our protest makes our point more strongly. The activists who have been bringing this message for years to Hancock, some of whom have been determined political opponents of U.S. crimes for decades; the Veterans for Peace, the crew of Occupiers from Buffalo, peace activists and students are informed and passionate, and they won’t stop. Participating in the action at Hancock made me more certain that bringing visible street protest in Chicago when NATO meets May 20/21 — and in the week leading up to the meeting — is essential. The international press will be there. Afghan President Karzai will be there, along with the leaders of the best-armed countries of the world’s strongest military alliance, currently occupying the world’s poorest country. Humanity and the planet come first – Stop the crimes of your government. Join us in Chicago.